Quick Summary: This article is the ultimate getting started guide about using a Nexus WordPress theme. You're in for a great ride to get your personal business site online, fast, easy and professional. In this article you can learn about the most important steps that are part of getting a great-looking website using a Nexus WordPress theme. If you're a business owner it might be that you have no idea what WordPress and WordPress themes are, and how they help you build a site. We've created a number of posts that delve into the most basic fundamentals of hosting, domain names, WordPress and WordPress themes. - WordPress Video Tutorials: Over 300 video tutorials covering a wide variety of topics. 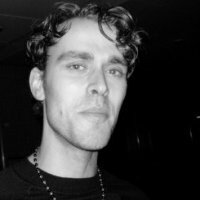 - FAQ: Over a 1000 Q&A's covering just about any topic you can think off. We're going to start off with installing WordPress, after which installing and activating the WordPress theme is the subject. Both of these can go wrong and are somewhat technical to troubleshoot. Most business owners know nothing or very little about WordPress. If you're one of those people and you feel uncomfortable with all things technical, or you have already run into issues and don't know how to fix them, be aware of our "Theme and Hosting" package. When you buy this package we take care of the technical side of servers, WordPress, themes, updates and troubleshooting for you. And you can be sure that you're focus is going to be on the website and adding content, not on the technical details of getting up and running. If you've already purchased a theme but want to switch to our Theme and Hosting package, you can ask for a refund and we'll be happy to provide you with one if it falls within our 30-day money-back guarantee. It all starts here. No WordPress, metaphorically speaking, means you want to drive a car without an engine. You won't get anywhere. If you're unsure about how to install WordPress find a hosting provider who'll do this for you. Don't try to install WordPress yourself. Installing WordPress is not something you want to be responsible for. If you're WordPress installation is wrongly configured, who are you going to turn to? Your want to concern yourself with building the site, not take on responsibility over every technical detail. And the biggest hosting providers all offer Wordpress so there really isn't any reason to try and install this yourself. Alternatively you can choose to host your entire site with us; theme included. Check the hosting page to learn more. After you've installed WordPress, you can install the Nexus Wordpress theme. The installation our WordPress theme should be a piece of cake if the WordPress environement is correctly setup. During the activation of the Nexus WordPress theme theme, we will automatically import a extended set of predefined and business specific posts, pages, categories, business rules, colors and more. The Uploaded File Exceeds The upload_max_filesize directive in php.ini: If you are unlucky, you will get an error stating that "The upload file exceeds the upload_max_filesize directive in php.ini" while you upload the theme's zip file. You could either ask your hosting provider to help you solve this problem, or you could watch this video to see how you can use a workaround through FTP as a workaround for that problem. Stop mac automatically unzipping files: In some browsers (Safari) if you download a .zip file, it automatically extracts. A very inpractical feature, since WordPress required you to upload the theme in the zipped format. One option could be to re-zip the extracted files, but a more practical solution is to change the preferences of your browser to stop auto unzipping. Watch this video to learn how that is accomplished. 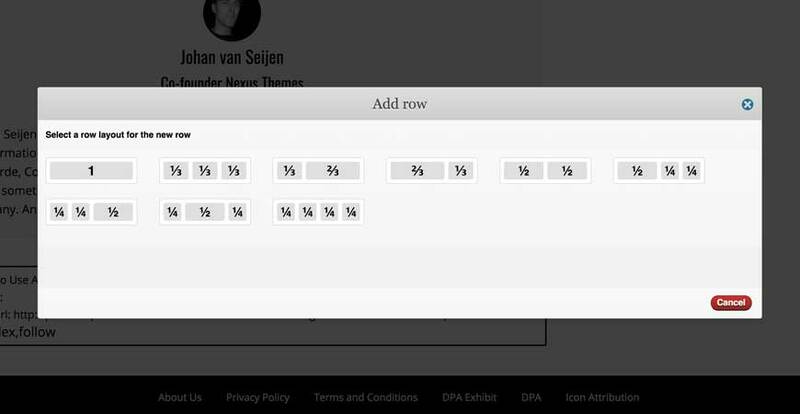 How to fix it when WordPress shows an empty white blank screen after the activation: If you get a blank screen after activating the theme, the most likely thing that happens if that there is a plugin that "bites" with the theme. To solve this, you should disable each of the plugins one by one, checking if this solves the problem. Of course you can't disable the plugins using the "regular" WordPress way (as WordPress shows a blank screen). The solution is to use an FTP client, and to find the folder that holds the plugins. By renaming the folder of each plugin, you will de-activate the plugin. After having done so, check if this solves the problem. If the website still is blank, continue with disabling the next one, until all plugins are disabled. How to remove all WordPress content and start from scratch: Wiping your site is not something that will happen regularly. But if you decide you want to removing all content from your site you can figure out this can be a consuming task if you need to do this manually (removing each post, page, media item, etc.). Therefore we have added a feature in our themes to support you with that. Be sure to know what you are doing; truly all content on your site will be removed if you proceed. When you buy a theme you have the option of also purchasing the licensed images. You can go for this option because you don't have good photo material yourself, don't want to invest the time to get them, or both. 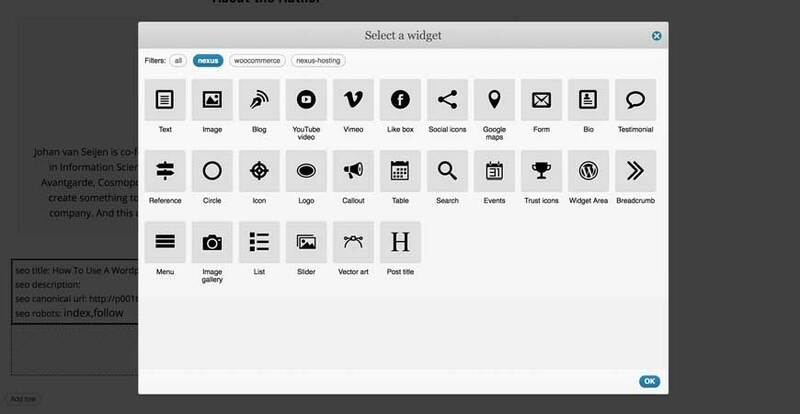 The images are installed into the media manager and your website with a "photopack" WordPress plugin. You have to install this plugin after you've finished installing and activating the Nexus WordPress theme. The brunt of the work will be changing the theme into a unique and appealing business website. We've try to enlighten this burden with the help of the turnkey installation, which will create the demo website (excluding stockphotos) upon activation of the theme. By replacing the dummy content via copy-paste actions, you should be able to make significant progress towards the end result. One of the most powerful features included in each of our WordPress themes is the unique front-end editor. The front-end editor enables you to edit the content and style of your website in a very intuitive way. If you're already familiar with WordPress and have used it before, you'll notice soon enough that we enable another other way to create and edit content. Whereas normally you would go to the WordPress backend to edit your content "front-end editing" enables the site owner to edit a webpage by being on the actual page itself. Next to the amazing front-end editor we have also ensured you can use the features of the WordPress backend. Probably the first thing you want to do is to change the colors of the website to suit your personal style. 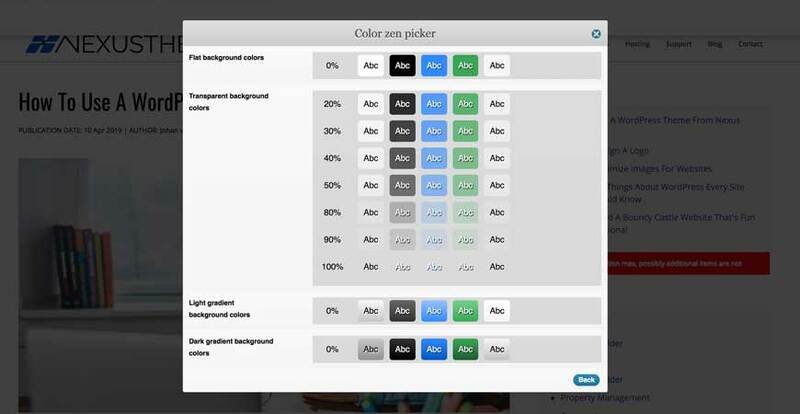 Instead of a fixed number of color schemes, each theme has a color palette which can easily be customized with the help of 3 colorpickers. The foreground (font) color in our themes is always black or white, depending on the color that you configure for the background, unless the text is a link. 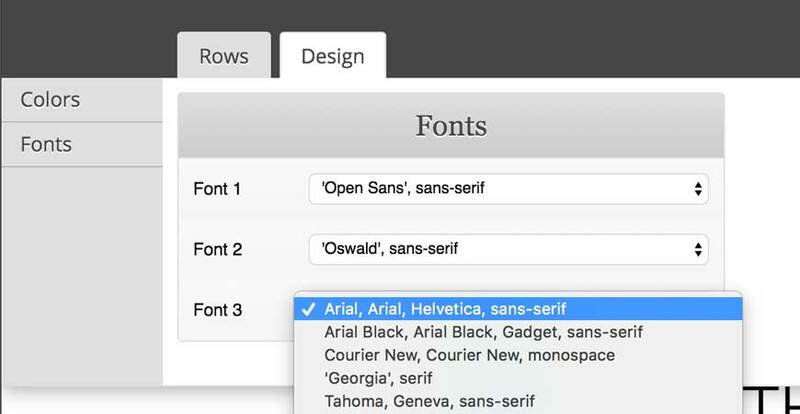 Its possible to pick specific fonts in your WordPress website. We have provided a free translation pack (WordPress plugin) that handles translating some hardcoded parts of the theme in various languages. Our themes support multi-columned layouts. Each row can hold up to 4 individual columns. Before you can place any content anywhere you have to create these rows. After you've activated a Nexus WordPress theme there's all kind of content you can edit. Each individual piece of content or building block is called a "widget", not to be mistaken with the classic WordPress widget areas. They range from basic types as the text, image and video widget to complex ones like the pageslider and definition list widgets. The face of your business has to be your business logo. Whether it's an elaborate piece of art or just your name in plain text it doesn't matter. You have to display it proudly on your website and we've got just the right tool to accomplish this. Almost all of our theme come with either a background image, an inline slider or a page slider that covers the entire background. If that's the case they are always featured on the homepage of your website. For all of our videos on background images, inline sliders and page sliders check out the WordPress Video Tutorials. As with sliders, almost all our WordPress themes have a blog section out-of-the-box. For all of our videos on how to work with your blog check out the WordPress Video Tutorials. If you don't have blog but do want one for your own site, we have a video about that as well. A lot of website maintenance can be pretty repetitive. Just think about your telephone number, which should be the same everywhere. Or your service overview, which should have the same styling applied to it. Or your call to actions, which should have the same piece of text in them. What it boils down to is you either want to re-use content or styling and we've made it our business to facilitate it in our WordPress themes. We understand that you might want to white-label the theme. For instance if you run your own web-agency. You can change the footer link to reflect your own business. If for whatever reason you need more support with your Nexus WordPress theme, feel free to fill out the form in our FAQ. We'll be happy to help you out and wish you all the best building the business website of your dreams.